Rainey Mitchell does not need a high-class flirt in her wounded world, but trouble and temptation wafts off the new professor as strong as his sandalwood-scented cologne. 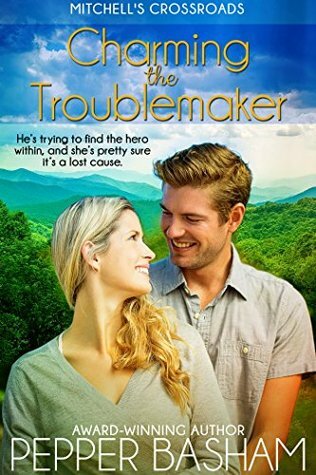 When circumstances thrust them together to save her tutoring clinic, can the troublemaker find the hero inside and encourage the reticent Rainey to open her heart again? "Rainey Mitchell is doing just fine. She has a great job helping children in need, her family is around her, she is mother to a fabulous little girl, and is getting over the betrayal of her ex-husband. Dr. Alex Murdock is not doing so well, as he is forced to work at a rural university, his life is full of secrets surrounding his family, and he has to start over in a new town. Luckily, Rainey, the daughter of his landlord, is there to get him settled. Rainey just wants to stay away from the new professor, who has the same charm as her ex. Unfortunately, they seem to need each other. Rainey needs his grant-writing ability to save her program, and Alex is terrible at the lecturing at which Rainey excels. The two must work together to fulfill their goals, but will they be able to do it? Rainey's insecurities and Alex's obsession with protecting his family could be their undoing. While this is the second in her Mitchell's Crossroads series, you can read it as a stand-alone. Though don't be surprised if you wind up snapping up book number one if you haven't already. The Mitchell family is one you'll love getting to know. Let's start by acknowledging that Basham uses classics as the base for her contemporary romance novels. She spins an Appalachian twist on them and ushers them into the twenty-first century in a way that still maintains their classic beauty while also making them all her own. So while there's echoes of classic romance in them, the reader is treated with a beautiful story in Basham's incredibly romantic and fresh voice. Charming the Troublemaker is no different! Rainey and Alex are quite a pair with enough of their own hurts and hang-ups to prevent an easy path to their happily ever after. Still, they handle them like adults and with growth all along the way. Simple misunderstandings don't become large stumbling blocks, but rather they provide ways for each character to step forward and shed their past while being so incredibly relatable. Alex and Rainey are far from perfect, but they make perfect progress together:) And oh, does Basham do swoon-worthy for her romance. She's not shy in writing her love stories but rather embraces the genre, diving full-force into it while maintaining clean lines. So if you love a heart-fluttering romance where the characters have chemistry yet restraint, Basham's books are for you. I happily recommend Charming the Troublemaker and you can purchase it here. What a FABULOUS review, Susan!!!! I especially love your comments about "echoes of classic romance" and Pepper's way of writing romance "with clean lines". I can't wait to see what she has in store for the Mitchell clan next! Me too! And thanks for your kind words. It was such a great book to read and I honestly think Pepper only gets better with each book she writes! And thank you for the WONDERFUL review!!!! I hope my positive book trend continues!! AGH! Just seeing this! Oh, I have NO doubt they will. You are a lovely writer!